Details: On Monday October 22, 2018 at 7:27 AM, CPD officers were dispatched to the railroad crossing intersection of Orange Avenue and Otis Avenue regarding a train colliding with a vehicle. Officers arrived on scene and made contact with the driver of the vehicle, who was identified as Martin Alberto Cruz Moran (age 41) from Exeter, CA. 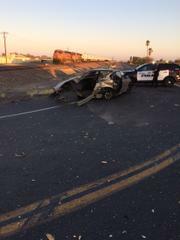 Moran was the sole occupant of the vehicle and complained of pain to his abdomen, due to the impact from the collision. Moran was later transported to a local hospital for medical treatment. Based on the investigation officers determined Moran was traveling E/B in his vehicle when it was struck by a Burlington Northern Sante Fe train traveling N/B at the intersection. Moran’s vehicle, a 2005 Chevrolet Malibu, sustained major damage to the rear end. 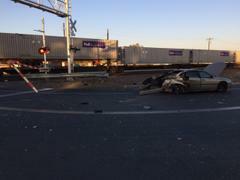 Additionally a railroad crossing arm was damaged due to the collision. -Slow down when approaching a railroad crossings and look both ways —TWICE!